Everett’s Northwest Neighborhood offers tree-lined streets, historic homes, and two waterfront view parks. Here is an environment where the sidewalks are never short of walkers and joggers, friends talking, and families on the move. It is a changing neighborhood that works at balancing the integrity of the past and the challenges of the future. Every third Thursday of the month, 6:30 p.m.
Our Next Meeting is **Thursday, April 18, 2019** and our focus will be our own neighborhood! 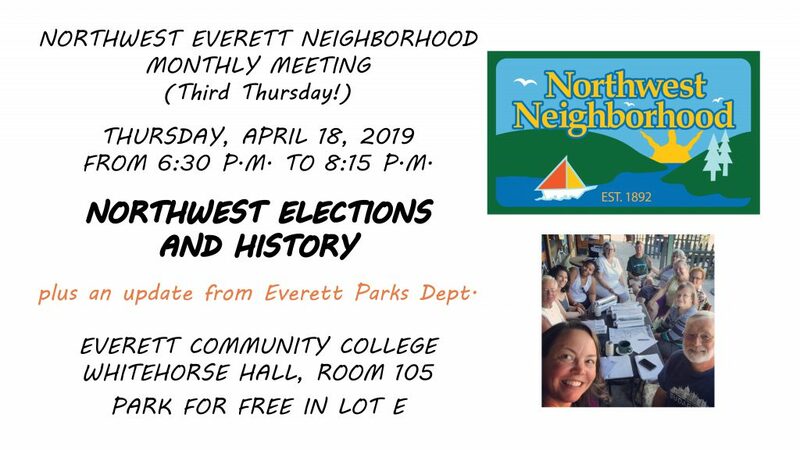 We’ll have our annual elections, hear a story about our history and Drew Nielsen, and get an update from Everett Parks Department on our neighborhood parks – Drew Nielsen, Grand, and Legion. Items in bold have been confirmed. May 17 – Whittier Bike to School Day – 7 to 9 a.m.
Click here to view our calendar of events for 2019. Volunteers are always needed. Interested in lending a hand? Send an email to info@northwesteverett.org. Your annual donation helps us host neighborhood events including the Easter Egg Hunt, Northwest Neighborhood Cleanup, storage, our web presence and e-news, and MORE. We appreciate your gifts and participation. Suggested donation is $52. That’s just $1/week. Click the Donate button on this page! If you get stuck, please email us at info@northwesteverett.org. Thanks!